Between the Women’s March, #MeToo and #TimesUp, 2017 was a breakthrough year for women, with gender bias and inequality increasingly being exposed. However, in the last six years, less than 10 percent of artists who were nominated for Grammys were women. 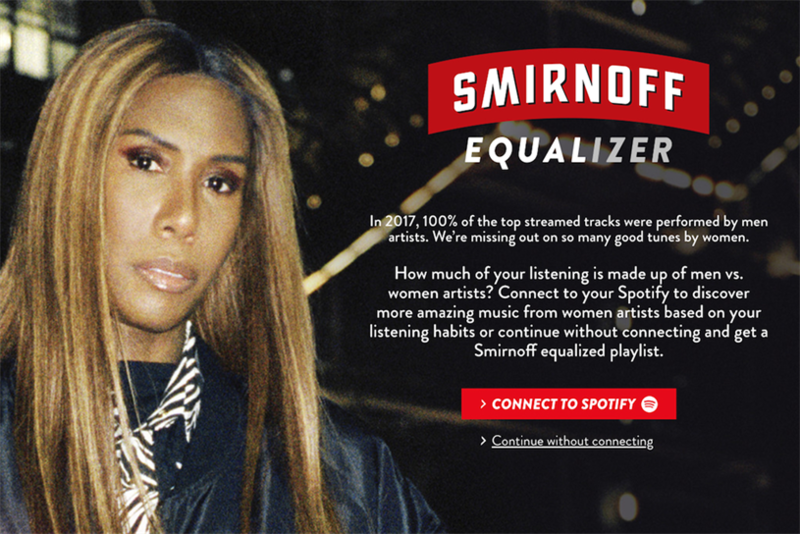 Smirnoff and Spotify also learned that 10 out of 10 top streamed tracks on Spotify were from male artists, which is how the Smirnoff Equalizer came to be. The tool, which launched ahead of International Women’s Day in partnership with Carat, analyzes people’s listening habits in real time and calculates the gender breakdown of the artists being listened to. The technology then creates "equalized" playlists of men and women artists for users based on their listening habits. And the effort yielded results: Spotify saw a 52 percent increase in female artists being streamed through the platform and opened up 2.7 million opportunities for female artists to be discovered.